Over the past week, I feel like summer has really arrived and when that happens, homemade strawberry popsicles happen. It just makes sense, doesn’t it? The weather has been pretty stinking hot for a while and I finished school a couple of months ago but for some reason, it hasn’t really felt like summer. I’m thinking that it might have something to do with the fact that I live around the corner from about three schools so even though I finished classes in April, I would still see all the kids going to and from school every day. Now that all kids are out of school (I can’t believe they go all the way until the end of June), I feel like summer has officially kicked off. The pace is slower and the city is starting to empty with so many people heading up north on the weekends. I think Toronto, and Ontario in general, are pretty spectacular in the summer. Plus those local strawberries? I don’t think it gets much better than local strawberries being turned into sweet and refreshing homemade strawberries popsicles. I was at the grocery store earlier this week and found some gorgeous Ontario strawberries. I ate an entire basket myself, but I had some leftover and knew that before I ate all of them I had to make something with them. I knew it had to be a cool treat, and I was planning to whip up a batch of my homeamde strawberry ice cream but then I thought homemade popsicles might be a fun option. I’ve been eating so many strawberries recently that I’ve really started to notice the difference in flavour from local, delicious Ontario strawberries to the ones from California we typically find in stores year-round. While we’re lucky to have access to many fruits and vegetables out of season, when you eat a strawberry (or any fruit that is) when it is local and in-season, it really allows you to enjoy the produce the way nature intended, and the flavours are always so much stronger. 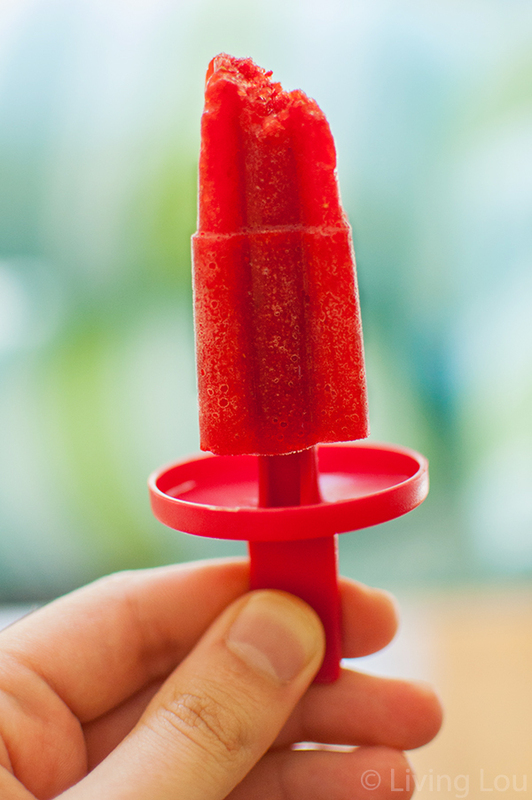 With Canada Day just around the corner and the 4th of July hot on its heels, these bright red strawberry popsicles are the perfect patriotic dessert. They aren’t the kind of dessert you can leave out on the table at a barbecue, but if you bring them out after a long day spent outside running around in the sunshine, no one will be able to pass them up. I’ll be serving these strawberry popsicles up on Canada day – plus they are a great way to stay hydrated throughout the festivities. If you’re looking for some more Canada Day ideas why not serve up a great Canadian potato salad or meatball sliders? Make use of in-season strawberries with this simple recipe for a frozen treat. With a touch of honey for added sweetness and balsamic vinegar to add a little complexity, these popsicles are perfect for Canada day or the 4th of July. A delicious summery treat to keep cool! Pour into popsicle molds and freeze for a minimum of 2 hours. To remove popsicles, run mold under warm water for about 15-30 seconds or until popsicles have loosened. I'm loving popsicles right now, these look delicious! I love that you added a little balsamic vinegar, I would've never thought to do that. I'll have to give these a try, pinning! Thank you Danielle! I find the balsamic just adds that little something extra to deepen the flavours of these popsicles! Let me know if you try them. I am in a popsicle making mode these days. 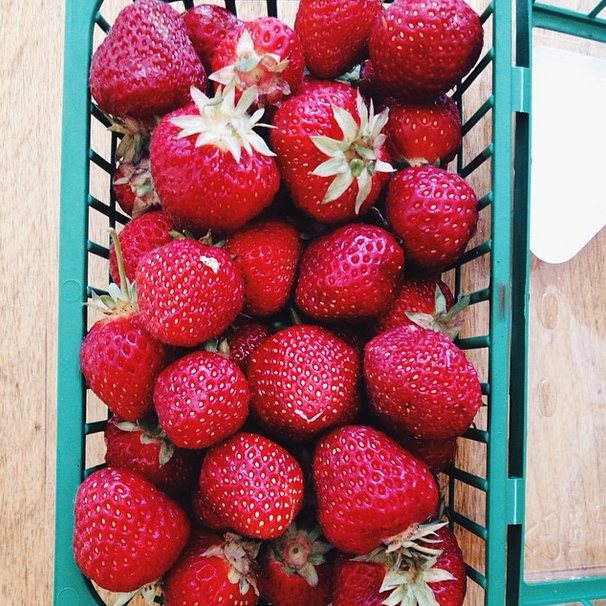 Can't get enough of those ontario strawberries, they seem to be extra delicious this year! Love the addition of the balsamic, I would have never thought to put that in a popsicle. And the rocket-shaped popsicle mould you have here is just adorable.Happy Canada Day, Lou! You can't imagine how much I would love one of these popsicles of yours right now, Lou. And it isn't even summer here where I am! I love that you added balsamic vinegar to there. Oooh, so delicious! It's such a pit that strawberry season is over where I live, because I really loved those little gems :') I'm pretty sure they make such wonderful popsicled indeed. These look fantastic - I adore the color! Thank you, Consuelo! There is nothing like local strawberries and they do add such a gorgeous colour to these popsicles. i love healthy treats and ice pops. they look great! Thank you, Dina! Let me know if you give them a try. Thank you, Olivia! Let me know if you give these a try, they are delicious. I just bought my popsicle molds a couple of weeks ago and can't wait to get making all sorts of different flavours. Genius idea to add balsamic vinegar. It makes them so grown up. I love me some popsicles. Thank you, Kathy! It makes the flavours really shine. We are SO on the same popsicle wavelength, Lou! I just made a twist on strawberry popsicles this past week and plan on sharing them this week! Your classic version looks just perfect and your photos are gorgeous. :) Pinned! Thank you, Sarah! Can't wait to see your recipe for a twist on strawberry popsicles they are perfect for this time of year.